This blog post is a response to the first two weeks of EDCMOOC: E-learning and digital cultures. Technological determinism is obviously far too simplistic a model to explain social change throughout history. The reductionism required makes it deeply flawed. Some technologies have certainly been world-changing – the wheel is the first that comes to mind. In the Earth’s Children series of books by Jean Auel, set in the Upper Paleolithic period, her protagonist Ayla single handedly invented or discovered many early technologies and skills, such as needles and horse-riding. The way in which the community around her rejects these things and/or Ayla herself illustrates a typical response of people to technology. It is rarely immediately accepted and world-changing. Looking at mechanistic models I am reminded of Asimov’s coining of “psychohistory” in the Foundation series of books: the idea that there is a branch of science (as yet undiscovered) that can explain and provide means for controlling the behaviour of mass numbers of people. Such a science has not and will not be invented, I believe, although there are and continue to be many socio-cultural theories that attempt this kind of analysis. A lot of dystopian novels and films especially in the science fiction genre are dystopian exactly in the sense that they describe the negative consequences of technological autonomy: the “machines” are never benevolent (Wall-E, Terminator, Demon Seed). The web essay by Chandler, D. (2002), “Technological determinism”, states that “even texts are autonomous of their authors once they leave their hands: as published works they are subject to interpretation by readers, and beyond the direct control of their authors”. This is taken further by many digital writers – who invite readers as co-authors, to give them not only multiple ways to interpret the material, but multiple ways to experience it, and even ways to influence it. The act of reading[writing]experiencing[immersing] becomes completely personalised. Technology adoption is coloured by people’s attitudes and assumptions that hang over from previous technologies. Technologies and the ways they are used are adapted and influenced by the people involved, or at the very least by the economic factors associated with their use and dissemination. The Luddites are generally assumed nowadays to have been anti-technology, machine-breakers, but in fact they were reacting against the economic strictures forced upon them by the economics of the new machines; their livelihoods were under severe threat. 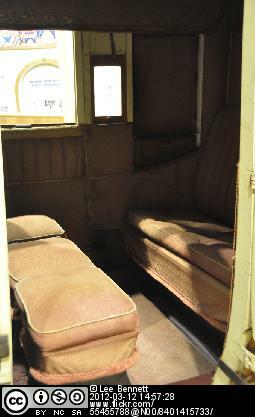 Early trains were separated into discrete compartments, with people facing each other exactly as in a stagecoach, the technology that preceded it. It wasn’t until a long time after the railways started that it was realised that a train could have a corridor running all the way down it – much more useful! – and that compartments were neither necessary or efficient. When mobile phones first came out, European young people took to text messaging in a big way – surprising those who thought people would want to phone one another using this new technology: it’s telling that it was the young who were at the forefront of this evolution. E-books are another case in point. There are very many ways of presenting information in a digital form, and hypertext and multimedia have huge potential for changing the way we access information and entertainment, yet when people think of experiencing a narrative digitally they think of “e-books”, a limited adaptation of an existing technology which itself was incredibly limited. Attempts to introduce hyperfiction, for example, never moved beyond a subculture of digital devotees. For the mainstream digital narrative means means e-books and online versions of TV and video – again adaptations of existing technologies. Online education often reproduces the existing patterns of education; classes, teachers, institutional buildings, libraries with shelves of books. iBooks are beginning to break the mould and introduce some of the more exciting possible digital forms and features – but on the iPad they are collected visually on shelves! It seems as though once we are programmed in this way, we cannot develop new ways of thinking, learning and doing. People say “I find it too hard to read a digital object on screen” because they have to learn new ways to navigate through it, and forget how long they took as young children to learn the assumptions and techniques for reading – not just letters and words, but how to navigate a page, or understand conventions for shape of books (not necessarily the same all over the world). Video phone calls have been posited for a long time, and the concept was rejected again and again, whatever technology was introduced to enable it, because society was just not ready. Ultimately, once Skype and web-cams came into use, the bar to adoption of video-calling finally dropped – because it takes place using new technology without prior associations, rather than an addition to the landline phones that everyone could picture and reject. So video calling, on computers, specialised video conference systems and mobile phones, but never on landlines, is now commonplace – to the extent that people should now perhaps be more inhibited about using it! Of course I thoroughly subscribe to technological animism. Of course the computers and printers and things in one’s house are against one. The times that things fail in just exactly the right way to completely screw up your day cannot all be coincidences! I hadn’t thought of the stagecoach/carriage before. I am using my laptop to type this – my glorified typewriter (a cultural meme!). I agree, how we use technology is never predictable, but do you think the visions advertisers use influence how we use new technology? Of course the visions advertisers use influence our use of technology, but so do many other things. I think Clay Shirky’s phrase “a new story rearranging people’s sense of the possible” can happen in many ways, advertising being one – also media, fiction, even news stories. Although this one isn’t about technology but is about influence, think of Michael Mosley’s documentary impact on the way huge numbers of people eat (the 5:2 diet). And sometimes a really good product design can do it – look at the two-finger zoom in and out on touch screens – everybody knows how to do that now and expects it.